Prime Minister Binyamin Netanyahu takes Kaiya on a stroll to meet the public in Jerusalem - and no one was bitten...! 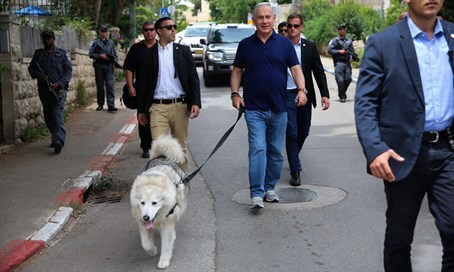 Prime Minister Binyamin Netanyahu took his dog Kaiya for a walk in Jerusalem Friday, where he met with members of the general public. Thankfully, the sometimes over-"friendly" first dog behaved for the cameras.